On campus at the Southern African Wildlife College (SAWC), we are installing an innovative new wastewater treatment system. As the system has only been used at one other site so far, setting it up at SAWC is an opportunity for applied learning. 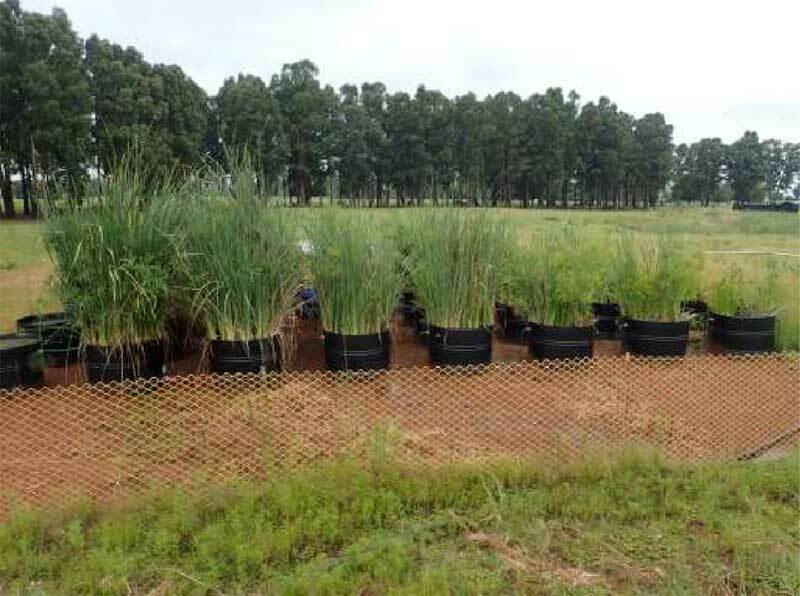 The new system takes the ideas of constructed wetlands and makes them simpler and more efficient. Constructed wetlands use reeds as a substrate for biofilm. This biofilm is made up of an array of microbes that contribute to removing harmful bacteria, such as E. coli, and unwanted chemicals, such as ammonia, from the water. The substrate in which the reeds grow also functions as a filter, removing particles from the water, and as a habitat for beneficial microbes. However, these traditional wetland systems have a number of drawbacks, as we have experienced at the College. Over time, the substrates get clogged and blocked reducing the filtration capacity. The system must be completely stopped, reeds and substrate dug out and replaced in order to reinstate the substrate filtration. The reed bed is also vulnerable to a highly variable water flow water, as is experienced at the college between peak times and holiday period lulls. If the reed beds dry out the reeds and biofilm dies off. If the reed bed is flooded the reeds also die back. It then takes time for the reeds and biofilm to re-establish. Lastly, if there is shallow standing water this breeds mosquitos, a health risk in a malaria area. As the water is not at a constant level, it is hard for mosquito predator numbers to establish themselves in high enough numbers to control the mosquitos. To counter these problems we are trialling a new twist on the traditional reed bed system. This uses similar principles but adds a level of flexibility that hasn’t previously been seen. The new system comprises of several rows of small, above ground tanks, connected in sequence. Each tank has its own floating reed bed. The root zone of floating reeds provides far greater surface area for biofilm formation than the reed stems. The root zone also creates a range of different aerobic and anaerobic zones that facilitate bacteria which consume E coli and others. In addition, the tanks allow for a zoning of oxygen availability from more available at the top and least/none at the bottom. This creates conditions in which ammonia and other unwanted substances are broken down into harmless gases. The system was developed and patented by Dr Johan Van Der Waal who has been advising SAWC on the set up and will be working with us to monitor the efficiency of this installation. Because the reeds float, the water levels in the tanks can vary with the occupancy of the college, without reducing their functionality. Because the tanks are above ground they are easy to maintain. In addition, because there are multiple tanks connected in sequence, one or more tanks can be bypassed if they develop any problems, without affecting the system as a whole. We will be using this new installation as an opportunity for several research projects. We will monitor the water quality at the various stages of the process to establish most efficient flow rates and treatment time. In order to ensure that the treatment tanks do not become breeding ponds for mosquitos we will be studying the invertebrate populations in and under the water. We hope to use endemic fish to help remove mosquito larvae from the water in the tanks and in the holding ponds. We hope to be able to put the lessons learned from the set up at SAWC in to action elsewhere. The set up will also be used as a demonstration site for students at the SAWC campus. Also, as the system is cheap, simple and flexible, ultimately we hope that it can be used in areas where there is not centralised water treatment plants. If anyone would like more information on anything mentioned here please contact the Applied Learning Unit.